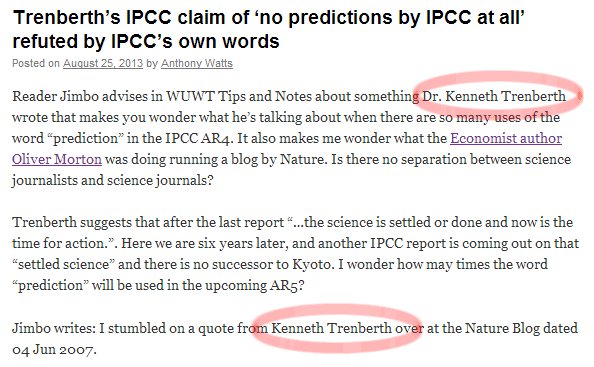 Anthony Watts, who has written many, many articles about Dr Kevin Trenberth, forgets his name and starts calling him Kenneth (archived - later corrected version). RCP8.5 Rising radiative forcing pathway leading to 8.5 W/m2 in 2100. The word "prediction" could be used when referring to a particular scenario as part of an "if" statement. For example, IF we were to continue to track on or above RCP8.5 I'd predict we'd face a very challenging future! The question is not about predictions vs projections. As Dr Trenberth writes in his closing paragraph: We will adapt to climate change. The question is whether it will be planned or not? Click here for an interactive chart in the Guardian, which you can play with. It shows CO2 emissions from around the world by country, per GDP, per capita etc. So while WUWT-ers are arguing over whether or not the IPCC makes predictions or is careful with terminology, the world continues to pour carbon dioxide into the air. We need to drop emissions, by a lot, if we are to have any chance of limiting global warming to just two degrees. Well, but that is their aim--to buy time for more emissions and more profits. So, no concern about wasting time. "....In fact there are no predictions by IPCC at all. And there never have been. The IPCC instead proffers “what if” projections of future climate that correspond to certain emissions scenarios. There are a number of assumptions that go into these emissions scenarios......"
He said there never has been any prediction made by the IPCC. Now here is the IPCC. Forecast/Prediction. When a projection is branded “most likely,” it becomes a forecast or prediction. A forecast is often obtained by using deterministic models—possibly a set of such models—outputs of which can enable some level of confidence to be attached to projections…. The WUWT-ers are having trouble working out the difference between IPCC model projections and model predictions. Perhaps they can think of it this way. IPCC models are used to make projections about climate (surface temperature, precipitation, ice cover etc) for a range of different scenarios. ...The word "prediction" could be used when referring to a particular scenario as part of an "if" statement. For example, IF we were to continue to track on or above RCP8.5 I'd predict we'd face a very challenging future! WUWT-ers are avoiding the question. The IPCC did make a prediction based on model results. It was a prediction derived from model run or runs. No? You really don't get the difference, or do you? Is it that you don't understand what Dr Trenberth was saying? Because you are basically repeating what he is saying. For a given scenario (eg BAU) you could call it a prediction. But that is very different from a blanket - this is what is going to happen regardless. Any "predictions" are, as you keep writing, conditional on a number of factors. In particular which emissions trajectory we choose for the coming years. Taken together the model runs and individual and aggregate results are projections not predictions. It's only in the context of an "if a scenario pans out" that the word "predict" could be used. I see a number of people on WUWT can't or won't accept the difference, so you're not alone. Please pay close attention to the point of the dispute. Focus on the last part of Trenberth's assertion. "In fact there are no predictions by IPCC at all. And there never have been." This is what was challenged. No, that wasn't what was challenged. That was not the real point to the dispute at all. What it was was a WUWT game of gotcha based on wordplay. Dr Trenberth is correct in essence. The IPCC doesn't say the world will xyz. It only makes provisional statements. If abc then xyz. Whether it uses the word "prediction" is irrelevant. If you read the IPCC reports more carefully, you'll not that even if the word "predict" is used, it's used in a conditional context. The reason the WUWT-ers are harping on the word is probably because they want to avoid the real issue - as I discussed in my article. Plus they want to continue to say "but you predicted xyz" without referring to provisos, scenarios, uncertainties or anything else that scientists take such pains with in their research. It's evasion and games, that's all. Typical WUWT. I am Jimbo so I know what I was challenging. Trenberth says "there never have been". This is not true, see the link below where I give an example of a prediction and the assertion by the IPCC of when a "projection" becomes a "prediction". Would you also concede that in the context of what he was discussing Dr Kevin Trenberth was correct as is my interpretation? Or would you say you were simply playing gotcha. And would you concede that at WUWT the followers have not yet graduated to considering the question posed by Dr Trenberth at the end of his article? And would you concede it will be some years before many are willing to consider his question because it's likely to be some years before a lot of them, perhaps most even, are finally convinced that an ice age is not going to come...any day now...any day now...? wait, why is Watts surprised that Nature employs science journalists? there's significantly more to the journal than the peer-reviewed papers: there's news, editorials, reviews, obits. does he expect professional researchers to write all of those as well? "...IT BECOMES A forecast or PREDICTION..."? If the IPCC does not do predictions then why define what constitutes a prediction??? Just answer this question. Maybe so that people understand the difference? Maybe in the hope that they'd think about scenarios before jumping to conclusions about projections for global average surface temperature and other changes to come. "Would you also concede that in the context of what he was discussing Dr Kevin Trenberth was correct as is my interpretation? Or would you say you were simply playing gotcha." No I do not concede. Trenberth made a clear statement. Now, do you concede that in fact the IPCC has made at least ONE prediction in the past??? Can you say yes or no? Is that you, Jimbo? Or is this another Anonymous. Whoever - by your comment you don't understand the climate models that Dr Trenberth was talking about. How they are built and how they are used. And I take it that you don't understand the concept of scenarios either. So there's little chance you'd understand any response I gave. For the benefit of anyone else who gazes down the page, I guess you go beyond the surface temperature projections of computer models (which is what Dr Trenberth was talking about) and could call the fact that warming is unequivocal and is caused by humans leads to implied predictions, because we haven't shown much sign of cutting CO2 emissions. So the implied if not stated predictions are that earth will continue to warm, seas will continue to rise, ice will continue to melt and the pH of oceans will continue to fall. But you don't need his climate models to make that prediction. And, barring a few supervolcanoes in rapid succession or an all-out nuclear war, it's a sure bet.